Humor in the Workplace? At least in the washroom! Ok, I’m not even sure what to say about his photo of a public toilet in Vienna. Except that — in spite of the fact that it is totally inappropriate for a public restroom — it makes me laugh. who runs the toilet announced Thursday that he would get rid of the urinals, after facing pressure from politicians who demanded their removal. 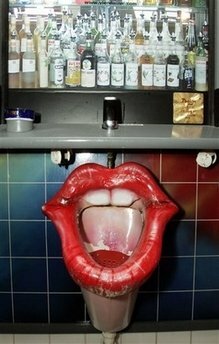 Can you imagine having this thing in your company’s bathroom? Wouldn’t this create a stir if it was in a government building? Although it makes me laugh, it would be sure to piss off a few people. (Pun intended.) ButI think that the effort this artist took to make even the most mundane of our human activies fun is absolutely right on. My point? That life is supposed to be fun, even the part of life we spend taking “bio breaks.” If I had a huge company, I’d hire this urinal-artist in a snap to create a bunch of fun even in the most boring room in the office. Nope.. this particular idea isn’t appropriate, but the concept cracks me up. A urninal shaped like a fire hydrant? Or a rock? A tree? A desk? Now we’re getting closer. Check out my motivational keynote speeches here. https://www.bradmontgomery.com/wp-content/uploads/2018/11/logo-1-495x198-1-300x120.png 0 0 admin https://www.bradmontgomery.com/wp-content/uploads/2018/11/logo-1-495x198-1-300x120.png admin2006-12-07 23:07:472006-12-07 23:07:47Humor in the Workplace? At least in the washroom! Want to Know How to Become a Motivational Speaker? Happiness is Obvious to all But Scientists.